I liked this way more than I expected! Enclave has been on my Goodreads list since November, 2013 and I finally got to read it. My students are thirsty for anything dystopian, so I am making an effort to read all the ones on my list. I often read the first book in a series, but don't always read the rest. 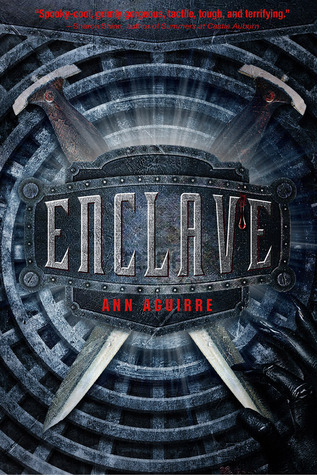 As soon as I finished Enclave, I downloaded its sequel. A plague has decimated the population of Earth and driven its inhabitants underground. Deuce grew up in one of these enclaves, where the life expectancy is short and growing shorter as mutants in the subway tunnels become more organized and deadly. She and her partner are exiled to the world aboveground and need to learn to survive in a place that may be even more deadly than where they left. I liked the character growth we see in Deuce over the course of the series, and how she is valued by males for her strength. There is a lot of fighting and action in the book, but I never wanted to breeze past it because the descriptions are interesting. While there are references to 'breeding', I don't think this book is inappropriate for my 6th graders. I can see quite a few of them devouring the whole series, as I know I am going to. This book was worth the wait!